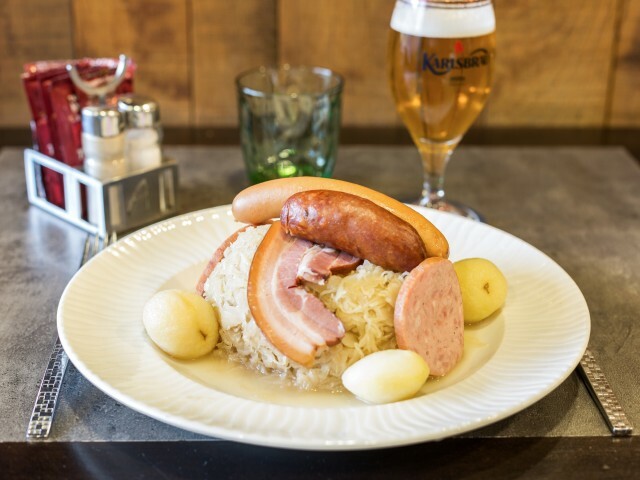 Located in the shopping center Les Rives de l'Orne, the Relais d'Alsace - Taverne Karlsbräu Caen impress with a unique atmosphere that is characterized by HEAT FRIENDLY and AUTHENTICITY. With many services nearby, Pathé cinema, train station, shopping center and 65boutiques parking where you are offered 1h30 parking, Relais d'Alsace - Taverne Karlsbrau be the ideal place to organize your meal with colleagues friends or family. Heads are featured in kitchens Relais d'Alsace. They develop a daily traditional, balanced and tasty. They were rewarded in their efforts by the title of Master restorer The room is in the same vein, the chefs de rang you rise your fillets and Tartar compose your ahead.